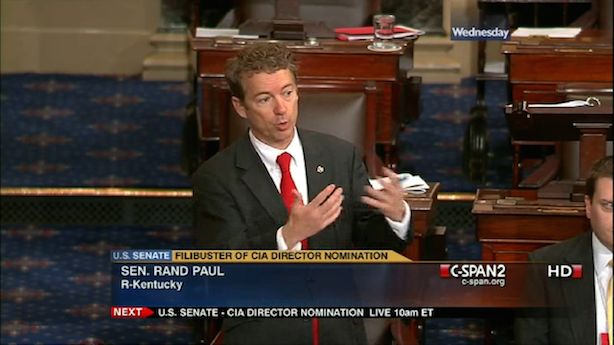 Rand Paul eyes early April announcement; Snapchat valuation could hit $19 billion; Maxim redesign. 1. Sen. Rand Paul (R-KY) is targeting early April to announce he’s running for president, according to The New York Times. Making it official would allow the Kentucky Republican to directly raise money for a White House bid. 2. Snapchat could bring in as much as $500 million in a new funding round, which would boost its total valuation to $19 billion, according to Bloomberg. The company was valued at about $10 billion late last year. 3. Maxim is looking to turn the heads of an older, more sophisticated group of men when its rebranded edition hits newsstands on Wednesday. The magazine has a circulation of 2 million, making it a leader in its category, but that number is down from more than 2.5 million in 2012. 4. How successful was President Barack Obama’s appearance in a BuzzFeed short film touting Healthcare.gov last week? One metric is health insurance signups through the Affordable Care Act, which the White House says topped 11.4 million this year, including 1 million in the last nine days. That number could rise due to an extended deadline. The Obama administration announced the total via a Facebook post. 5. The New York Times is considering tweaking its subscription model with executives pondering the future of NYT Now, the Millennial-focused app that delivers an updated rundown of the day’s top news, according to Capital New York. 6. President Obama is expected to speak on Wednesday at a White House summit on combatting extremism with a call for countries to do more to keep marginalized youth from joining radical causes. Critics have complained that he has not used the term "Islamic extremism" in addressing the issue. 7. Bloomberg News is touting its redesigned hub Bloomberg Business with an outdoor advertising push in New York and San Francisco. While the effort only has a $1 million budget, the company is hoping its targeting — ads will appear in high-end coffee shops and gyms — will attract readers. 8. Carlsberg, the world’s fourth-largest brewer, is switching CEOs after a drop in sales in Russia and Eastern Europe in Q4 sent its profit in the period spiraling. Revenue was also down in the last three months of 2014.